MTSU gives True Blue welcome t.. Unity Luncheon honors 4 ‘unsun..
An MTSU construction management team has brought home another top-10 finish at this year’s national competition in Las Vegas on the heels of their 2012 championship. Led by senior Jason Harrison, the six-member MTSU Land Development/Residential Building Construction Management team placed eighth out of 31 teams in the Jan. 22-24 International Builders’ Show. MTSU, which won in 2007 and 2012, has earned nine top-10 and seven top-five finishes. Dr. David Hatfield serves as adviser and head coach with assistance by construction management faculty members Duane Vanhook and Dr. Douglas Chelson. “Being a part of the residential construction management experience this year has been one of the most influential aspects of my college career,” Harrison said. In addition to Harrison, a Pittsburgh, Pa., native who lives in Murfreesboro, the team included Brad Johnson, a Madison, Ga., native who lives in Nolensville, Tenn.; Andraus Hill of Nashville; Kelvin Owens of Antioch, Tenn.; Kyle Wix of Lafayette, Tenn.; and Jared Newell of Nolensville. Harrison and Johnson are the lone seniors. The others could return for the 2014 competition. 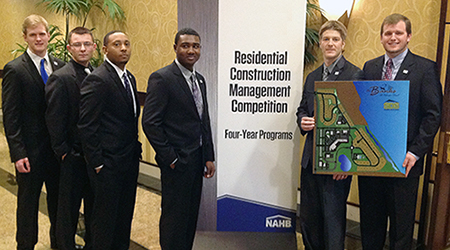 “The competition is designed to give students the opportunity to apply skills learned in the classroom to a real construction project by completing a management project proposal,” said Hatfield, who is head of the land development/residential building construction management and the electrical construction management concentrations. In this year’s competition, students were given 118 acres, including an existing rock quarry, to develop on the banks of Utah Lake in Saratoga Springs, Utah. The MTSU team’s project, called The Banks at Pelican Point, was a mixed-use residential and commercial development and included a church and a pond that replaced the quarry. The competition was judged by a panel of four people with varied backgrounds in the construction industry acting as potential project investors, Hatfield said. Each team made a 15-minute presentation of their proposal followed by a 15-minute question and answer session. The panel determined then which team had the most complete and financially viable plan, the adviser explained. On average, each MTSU team member spent 300-plus hours completing the project booklet, Hatfield said. The booklet included financial figures, market analysis, sales strategy, scheduling, estimating, infrastructure/house plans, sustainability, cash flow and a management approach for the project. “It is truly a tribute to our program and our students to perform so well at the national level,” said Dr. Walter Boles, chair of the MTSU Department of Engineering Technology. The Land Development/Residential Building Construction Management concentration is part of the ET department. “Our students did a great job at demonstrating their knowledge and skills in estimating, scheduling, safety, construction management and building construction,” added Dr. Bud Fischer, dean of the College of Basic and Applied Sciences. Local industry leaders David L. Hughes, Mark Lee of SEC Inc. and Ross Bradley of TDK Construction applauded the team’s efforts. Hughes serves as chairman of the Land Development/Residential Building Construction Management concentration. MTSU’s program is affiliated with the Rutherford County Home Builders Association, the Home Builders Association of Middle Tennessee, the Home Builders Association of Tennessee and the National Association of Home Builders.